Tenzi...A Fast, Addictive Dice Game! Who Wants to Play? Tenzi – the simplest, most action packed dice game I’ve played in a while. When we were in Chicago visiting my sister, we just had to stop at the local Village Toy Shop. It’s located just next door to one of my favorite bookstores, The Book Stall in Winnetka, Illinois (a small suburb just outside of Chicago). I was intrigued by this toy shop, because it was one I had not heard of before. It wasn’t a chain – which is what I’m used to. It was just a small, cute toy store, and if you’re like me, I LOVE a fun toy store. I had not noticed it on my previous trips – I was so enthralled with The Book Stall, but this time, their window display caught my eye. I mean look at this place! Wouldn’t you want to walk in and check things out?? I just loved everything about this sweet little store! 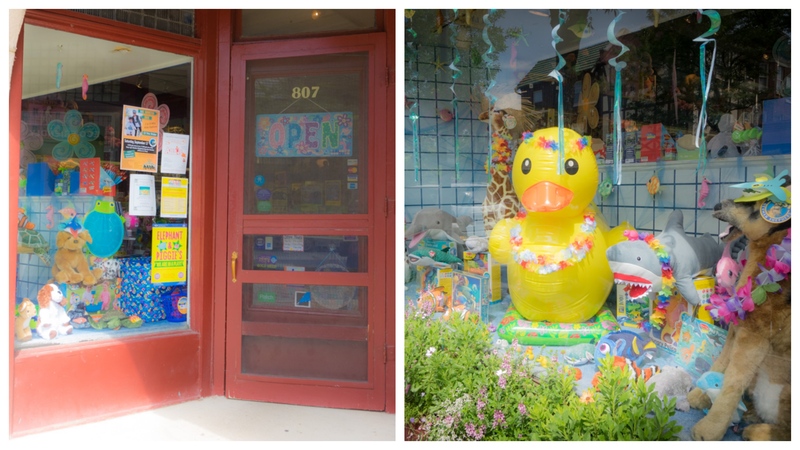 If you check out their website, you will read that since opening in 1948, the Village Toy Shop has been a local favorite for wonderful toys. We have been owned by the same family for 25 years, and we are proud of the high quality of our toys. We give each and every customer special attention, and we will help you find the perfect toy for any child! With our free gift wrapping service, free local delivery, and convenient location, look no further for classic and new toys alike. All you need are the 4 sets of dice, and you are ready for some fun! We played on the floor for a long time – I wanted to keep playing until I won, but we would’ve been there all day! How Do You Play Tenzi? In its simplest form, the game is for 2-4 players, unless you have more than one set of the Tenzi game! The goal is to roll all of your dice until all the die of your color are showing the same number. Sounds simple, right? Well…believe me, when 4 players are rolling as fast as they can to win, the excitement level goes way up! So the first player to get all 10 of their dice to match and shout “Tenzi” is the winner. TENZI TOWER: Instead of putting your successfully rolled dice aside, stack them one on top of the other. First player to get all ten of their dice stacked with the same number on top, and shout “TENZI” wins! SPLITZI: Instead of trying to get all ten dice of one number, try to get five dice of one number and five dice of another number, and then yell “TENZI”. TEAM TENZI: Join forces and play in teams! Get all your team’s dice on one number. MEGA TENZI: Ten dice not enough for you? You’ll really have your hands full with twenty dice! Now that would be totally crazy, fun! STEALZI: If you see another player roll the number you’re going for, steal those dice and give the player an equal number of your dice. No stealing on the first roll of the game, or from any player going for the same number as you! I think this would add a totally fun element to the game. Can’t wait to try this one. TWISTED TENZI: Mix and match your favorite TENZI games. Play TEAM TENZI TOWER, or TIMED TARGET TENZI, or even MEGA TENZI TOWER SPLITZI STEALZI. Whew! That’s crazy and confusing, but fun!! So…how fast are you? I’m not sure I’d consider myself a “Tenzi Master” just yet, but I’m getting close! I think right now, I’m probably more of a “Cubie Newbie” based on my performances so far. My kids however, they seem to be closer to “Dice Dragon” – not sure why they are so much better than I am. But I’ll keep practicing. I’m determined to be a Tenzi Master at some point! Where Did the Game Tenzi Come From? 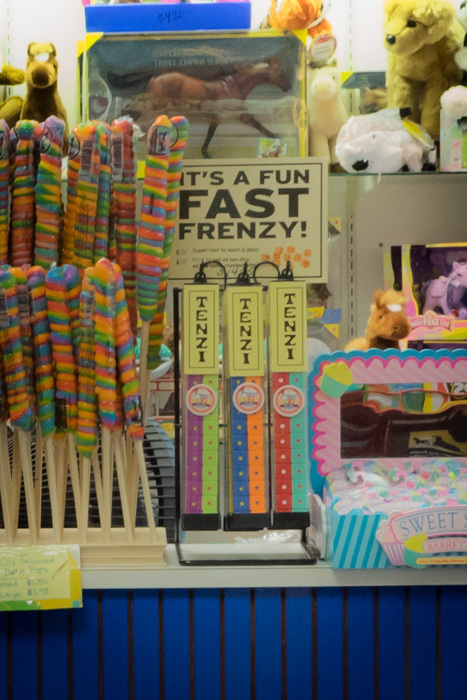 Like the package says…it’s a fun fast frenzy!! The history of TENZI is an amazing story. Sort of like a dream come true for creators Kevin and Steve. As you can read on the I Love Tenzi Website, Kevin and Steve ran into each other shopping one day after not having seen each other in quite a while. “What are you up to these days?” asked Steve. “Thinking up board game ideas,” answered Kevin. “Sounds interesting. We should put our heads together and come up with something fun,” Steve replied, half-jokingly. A few months later, Kevin handed Steve a bag of dice and said, “Let’s come up with a dice game.” Steve returned the following week and proclaimed, “Got it!” After Steve explained the oh-so-simple rules to TENSI (original spelling), Kevin asked dubiously, “That’s it?” “Let’s just play,” said Steve, and play they did. Game after game, the dice rolled and the rules evolved. At least that’s the story on their website. By the end of that day, their original game called TENSI had become TENZI (different spelling), and Kevin and Steve were excited about this fun, fast, addictive game they had come up with. That was the easy part. Now they had to convince other people that this game was as brilliant and as much fun as they said it was, and find some stores who would give them some space on the shelves to hopefully sell some games. After lots of struggling with prototypes and retailers, they finally found one store that offered them some shelf space. Since this time, TENZI has exploded in popularity and now even has its own app for iPhone and Android phones!!! Pretty impressive story, right? Do They Have a Tenzi App? Well guess what – while reading up on Tenzi, I discovered online that they do in fact, have a Tenzi app for iPhone and Android phones, so of course I went and downloaded it to my phone. I thought, I’ll just check out this app for my article. Well…a couple of hours later, I can tell you that the app is just as much fun as the game! If you’d like to try it, click on this link: Tenzi App for iPhone and Android. I can’t wait to hear what you think. I was actually quite impressed with the app. Not only can you play the simplest form of the Tenzi game, but there are many other options as well. When I first started, I just played the regular, simple version of Tenzi, but then as I started checking other games out, I realized there were several things to do within this app. The app offers Tenzi, Splits, Target Tenzi, Addzi, and Timed Tenzi – all games with a slight variation to the original game. And with Addzi, a random number between 10 and 60 is shown at the bottom of your screen. The object is to roll the dice until all 10 of them add up to that number! Hello!! My kids will be practicing their math facts without even knowing it. Genius, right? So anyway…enjoy your app. It’s a perfect thing to play while you’re waiting in the carpool line! Well…Giant Tenzi isn’t actually a thing, it’s just a crazy, fun idea I had when I saw some pins on Pinterest about making giant backyard dice to play Yahtzee! I started thinking… How fun would it be to play Tenzi outside? 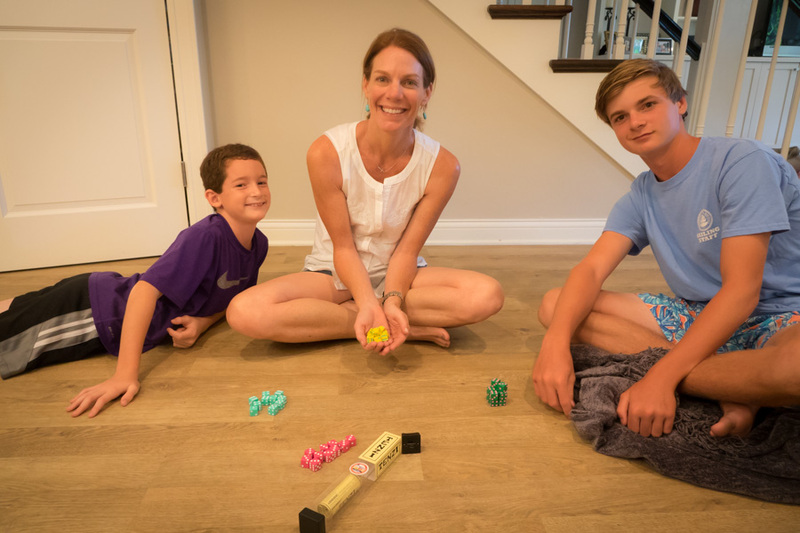 If you made several sets of giant, outside dice and painted them like Tenzi dice, then it would take a lot longer for each game of Tenzi to be played out. If you can only hold one die in your hand at a time, it would take quite a while to get all 10 with the same number face up, right? Are you following me? So…now I’ve put my husband in charge of making this set of giant Tenzi dice for us. I’ll let you know when (if) that actually happens! And for those of you who don’t want to make your own giant yard dice, don’t worry – you can buy giant yard dice! All you’d need to do to these is paint them – pick 4 different colors and create 4 sets of 10. You’ll be ready for Giant Tenzi. I’m thinking this might be the only way I get 40 giant dice for my Giant Tenzi tournament I’ll be having sometime – maybe a Tenzi, Bocci, Corn Hole party at my house. People can rotate through the stations. Not sure what Bocci and Corn Hole are? Read my article called What is Bocci Ball? Do You Prefer Bocci Ball or Corn Hole? And I think that the bigger the dice are, the more fun the game will be. What if they were so big that it took 2 hands to roll each dice? Fun, right? According to a link on Sometimes Homemade’s Website, making your own giant dice isn’t that difficult! In their article called DIY Giant Wooden Yard Dice, they tell you exactly what you need to build your own set of dice! 6 unfinished wooden blocks – 3.5?-4? NextUpstart Crow Bookstore and Coffee House – A San Diego Gem!